Our desire to hunt is more than just atavistic. [Author’s Note: I wrote this last fall and have since sent it in to numerous hunting magazines. None of the magzines were interested. I still like it so I thought I’d put it on the blog and see what you reader’s think. Any feedback is appreciated]. Here is another idea. Perhaps this incessant desire to hunt does not derive from the baser part of man, but rather from the more noble characteristics of our psyche. In primitive tribes, the role of the hunter was to provide food for the family. Hunting was an essential way that man could “by the sweat of his brow” provide for his wife, kids, and community. What could be nobler than that? But for the ancient hunter, hunting was more than just a means of support. In Meditations on Hunting, the venerable Jose Ortega y Gasset pointed out an important overlooked aspect of hunting: “Hunting submerges man deliberately in that formidable mystery and therefore contains something of religious rite and emotion in which homage is paid to what is divine, transcendent, in the laws of nature.” Likewise, in The Soul of an Indian, Charles Alexander Eastman, or Ohiyesa by his Sioux name, wrote regarding the Native American’s perspective on the hunting of animals: “While we humbly accept their sacrifice of their bodies to preserve our own, we pay homage to their spirits in prescribed prayers and offerings. “ In other words, for Native Americans, hunting was not so much about killing, as it was survival, and it was done with reverence, respect, and gratitude for the animals harvested. In short, it was a spiritual pursuit. Why should it be any different for us? Hope springs eternal, especially for a hunter at dawn. Hope is a key element of hunting. Webster defines hope as “a confident expectation that a desire will be fulfilled,” “a wishful trust,” “something which one longs to see realized.” By their very nature, hunters understand and live this principle. Every time we step into the field, we don’t know that we are going to succeed, but we hope that we will and we do our best to make it happen. Case in point, this past opening weekend of blue grouse season, my French Brittany, Sunny, and I found plenty of birds at a favorite cover, Grouse Ridge, many of which, she pointed beautifully, but I could not hit one with my new 20 Gauge over and under to save my life. I drove home that day a little more humble. The gunner honors Sunny’s point on Grouseketeer Ridge. The following weekend, we went back to the same place, this time armed with my old familiar 12 Gauge. Try as we may, we could not find one single blue grouse where there had been so many the previous weekend. 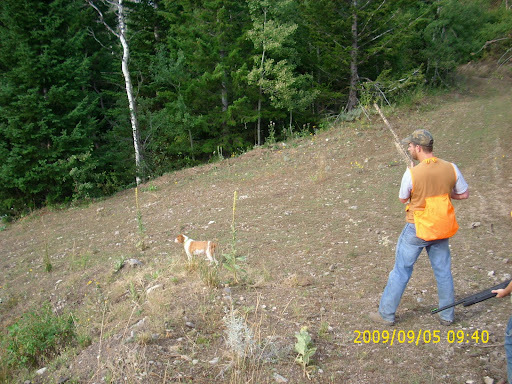 Across the canyon from Grouseketeer Ridge is a razor ridge that my dogs and I have hunted unsuccessfully in the past. I named it the “Knife’s Edge” after its major geographical feature. On the far side of the Knife’s Edge in the draw, is a small spring creek, which seems like it should be a grouse magnet. Alongside the creek is a steep switchback road cut by loggers that I always hope to find birds along, but never do. At the top of the mountain is an idyllic grassy opening of about two acres surrounded by pine trees and quaking aspens. Many times, I have walked through this area recognizing it as prime habitat for insect-eating blue grouse, but despite its appeal, I had never found any birds there. On this bright September morning, Sunny and I worked our way into the grassy opening. “One of these days, we are going to find a pile of birds in this spot,” I commented prophetically to Sunny. No sooner had I said this than a covey of four blues flushed in front of us flying in different directions. The bird flushing to my left dropped at the shot. I swung right for the double, but when I touched the trigger, nothing happened because my semi-auto jammed. After fixing the gun, Sunny and I walked forward hoping to find another straggler and almost unbelievably, another covey of four or five birds about twenty yards away scattered in all directions. I poked a few shots after them, but missed. Sunny and I approached the area from which the second covey flushed and another single flushed. As I swung to catch up with one and pulled the trigger, he made it safely behind a thick pine tree, which absorbed my shot. In fact, after the chaos subsided, a large branch fell belatedly to the ground. Good for him, I thought of the lucky, escaping grouse. To hit a flying bird may be second nature for some, but for me it has always been a challenge. Some days it seems possible and some days I cannot hit the proverbial broad side of a barn. 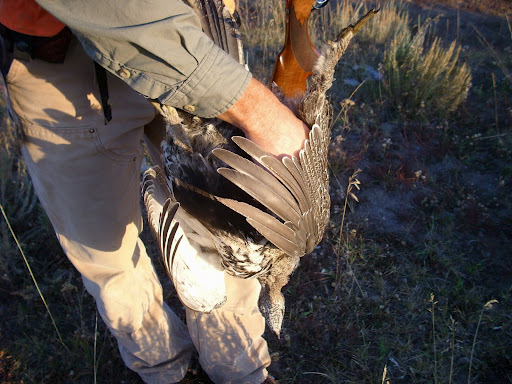 Of all the game birds, sage grouse are the biggest upland bird harvested on the wing in the U.S. One would think that because of their size they would be easy, but many a hunter, including me, has been made the fool. These birds are tough and they fly faster than you think. 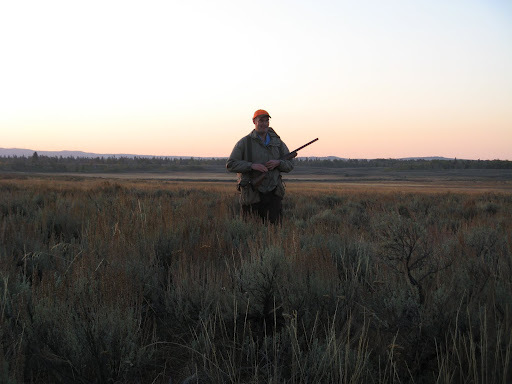 Just recently, on a sage grouse hunt—after my good friend Matt Lucia harvested his limit of two sage grouse in under fifteen minutes with just two shots— I really struggled to connect on multiple flushing mega-grouse. It’s easy to get discouraged at such times. However, all one can do is persevere through such shooting slumps. 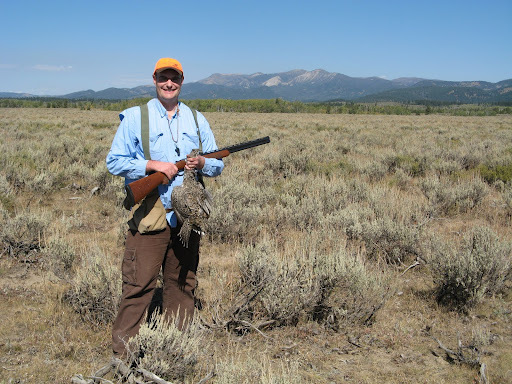 Matt picks up one of his two big sage grouse. After a much needed break and Weinhardt’s rootbeer at the small town store, Matt and I decided to try to find a new place to hunt. Matt picked the brains of a few locals and heard about a pond not far from the main road surrounded by sage brush. “I saw some sage hens in that area just two days ago,” the elderly local offered helpfully. As we arrived at this new area, in paraphrasing the words of Harry Dunne (Jeff Daniel’s character) to Lloyd Christmas (Jim Carey’s character) in the movie Dumb and Dumber, I told Matt, “After this morning of poor shooting, I need to ‘totally redeem’ myself!” Considering the source of the quote, we both laughed. Instead of reaching for the old 12 Gauge, however, I grabbed the new over and under (the gun I had struggled with earlier this season) in hopes of changing my luck. We only had less than an hour to hunt before I needed to head home. 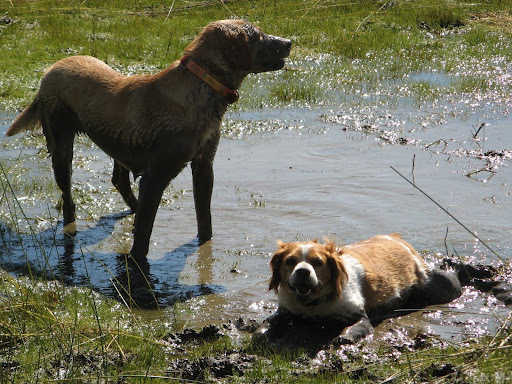 Upon reaching the pond, the dogs reveled in the last remaining muddy water on this warm September morning. This was a much needed reprieve from the heat of the day. “Sunny looks like pig in her wallow,” I laughingly—but affectionately—commented. Matt had to agree. The dogs cool off on a hot September afternoon. Feeling refreshed, we all took to the sage surrounding the pond, which— based upon the comments of the old timer—caused me to have a positive hopeful feeling. About a hundred yards from the pond, Sunny turned birdy and a grouse suddenly jumped about five feet straight up into the air and landed back on the ground. Sunny pursued and the confused grouse flushed and flew straight towards me. I rarely make that shot and missed it with my bottom barrel. When the bird flared off to the right, the shot string from the top barrel caught it solidly. “Yes!” I yelled triumphantly. Sunny eagerly pounced and brought the bird to hand. With the heavy bird bumping against my back, I enjoyed the long walk back to the vehicles. In thinking about appropriate names for this new hunting covert, the one that best captures the experience is the “Lloyd Christmas Covert” because, with that shot, I totally redeemed myself with only minutes left in the hunt. Grouse in hand: The fulfillment of hope. The drive to hunt is so much more than a primal instinct. As the Native Americans recognized, hunting is a spiritual endeavor. Hunting is the opportunity to go out without any guarantee that we are going to succeed, but to still desire success—to exercise a little faith, if you will—and then do our best to make it all come together. At its core, hunting is Hope. This hope drives us to hike up hill and dell behind birddogs all day long without a thought of fatigue. This hope is what makes us anticipate with excitement opening day, a staunch dog’s point, the chaos of the flush, the smell of burnt gun powder, and the thrill of making a nice shot. This same hope inspires us in our life to strive to accomplish things that are difficult—or even seemingly impossible— but that are worthwhile. In the bible Paul wrote, “For we are saved by hope.” When it comes to hunting, hunters have understood this important truth since the dawn of time. And hope is what keeps us going afield today. Next Post FIRST DAY OF SPRING . . . WAHOOO!!!! Wonderful writing. I find hunting is also about opportunity and the challenge of matching wits with natures wild creatures. We are slow in our uptake of skills, yet we remain eager in the pursuit, alas hopeful.